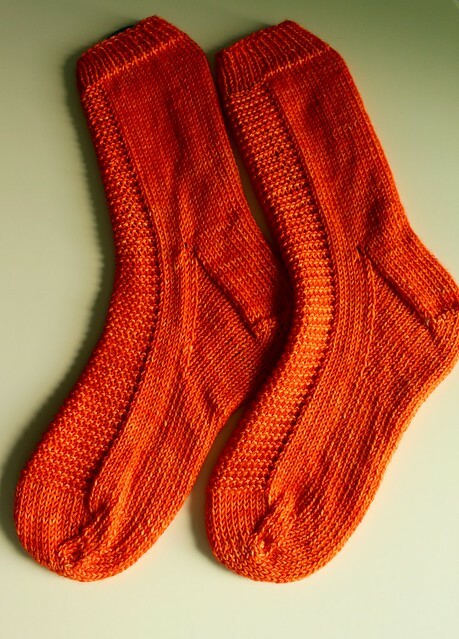 The request was simple: an orange pair of socks to keep my godson’s feet warm. I’m not a big sock knitter but I knew I could do it for him and his birthday was coming. Besides the kid is just the cutest (evidence of his cuteness seen here) and I can’t deny him a request. So I started by knitting a test pair of socks just to make sure I got sock construction down. And then I moved on to a real pair. I knit AJ a pair of the Tin Can Knits Rye socks. A free pattern and knit up in a dk weight yarn. Way less intimidating than getting sock yarn and using tiny needles. I’m getting less and less intimidated by tiny needles – I just keep reminding myself that I will not be intimidated by things I don’t know in knitting. I just have to learn! The only issue I had was that at the age of 15, my adorable godson is 6 feet tall and with size 12 shoes…and counting. He doesn’t seem to want to stop growing! So I knit the large and they were big socks but I figured even if they were a little big, he’d grow into them. Besides, he just wants them for when he’s in the house playing video games so if they end up fitting a bit big he doesn’t care – he just wants to be warm! 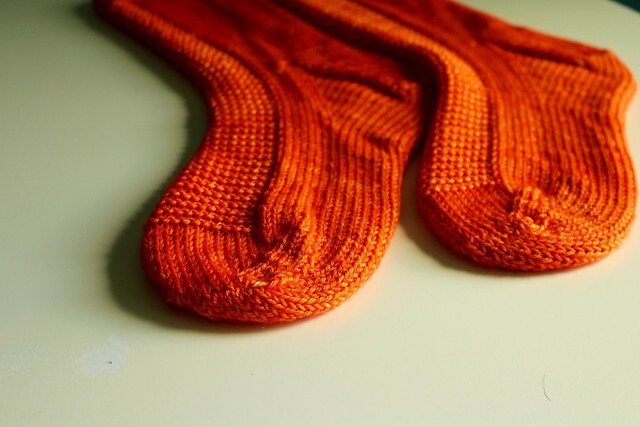 And since he’s a teenager I knit them up in Neighborhood Fiber Co’s studio worsted (it’s more like a dk/light worsted) in the super bright orange Otterbein colorway so that he could throw them in the washing machine but only had to air dry them. To ask a teenager to handwash a sock is kind of laughable to me. I also get why people are sock knitters, it’s such an easy and portable project to always work on! Sometimes carrying a top down sweater around can be just a little too cumbersome, so I think I’ll be working on a few socks here and there for my cousin in Chicago to keep her feet warm for winter. And if you’re looking to dip your toe into sock knitting, Knit Picks released the individual patterns for their Toasty Toes collection for free on their website! I downloaded a couple to try out. A coworker gave up trying to knit and gave me a few bundles of sock yarn so I’ve got something to look forward to knitting next! 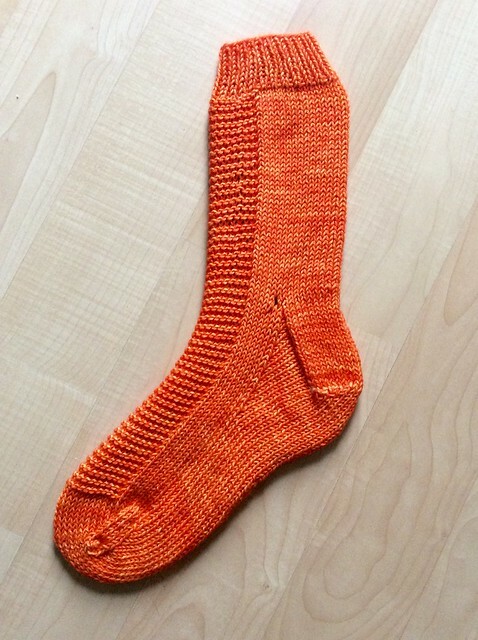 What’s your favorite sock pattern to knit? Share! I’m assuming your co-working who gave up trying to knit is in intensive car for craziness?! Just kidding, of course, but it’s so hard to imagine not loving knitting. Holy moly! Actually, he’s only semi-Cher approved. LOL She lets him pet her as long as he doesn’t look at her. If he looks at her, she growls at him. She’s such a finicky old lady but that day she hopped in his lap all on her own. And my coworker said she was stressed out by knitting, I happily took over her stash. Haha! That totally cracks me up for some reason. Aren’t dogs the funniest? Gotta follow the rules. Lolol! Sounds like you were in the right place at the right time for the stash take over! They were an easy and quick knit. A great free pattern! Wooohooo! A sock conversion has taken place. I will remember this entry for-ever! Way to go DWJ, you did it and they look sooooo good! Nice color choice. I’ll definitely have to get some Neighborhood Fibers soon. I am a sock knitter and I love to enable others. Try the Addicted to Sock Knitting Facebook Page. Best group ever.